The Grumpy Economist: Is Finance Too Big? Is finance too big? Here's a draft essay on the subject. There is a pdf on my webpage, and updates, revisions and a final version will end up there. This came about as a "response essay" to Robin Greenwood and David Scharfstein's "The growth of modern finance" for the Journal of Economic Perspectives. That's why Robin and David are the target of a lot of criticism. But they're really just standing in for a lot of opinion that finance is "too big," in part because they did such a good and evenhanded job of synthesizing that point of view. So, sorry for picking on you, Robin and David! I'm sure the JEP will make me cut it down and tone it down, so this is the fun first draft. The US spends $150 billion a year on advertising and marketing. $150 billion, just to trick people into buying stuff they don’t need. What a waste. Wholesale, retail trade and transportation cost 14.6% of GDP, while all manufacturing is only 11.5% of GDP. We spend more to move stuff around than to make it! A while ago, my wife asked me to look at light fixtures. Have you seen how many thousands of different kinds of light fixtures there are? The excess complexity is insane. Ten ought to be plenty. It’s ridiculous how much people overpay for brand names when they can get the generic a lot cheaper. They must be pretty naive. Business school finance professors are horribly overpaid. Ask an anthropologist! We must really have snowballed university administrations to get paid nearly half a million bucks, and work a grand total of 10 weeks a year, all to teach students that there is no alpha to be made in the stock market. Did you know that Kim Kardashian gets $600,000 just to show up at a nightclub in Vegas? How silly is that? It’s a lot of fun to pass judgment on “social benefits,” “size,” “complexity” of industry, and “excessive compensation” of people who get paid more than we do, isn’t it? But it isn’t really that productive either. As economists we have a structure for thinking about these questions. We start with the first welfare theorem: loosely, supply, demand and competition lead to socially beneficial arrangements. Yet the world around often doesn’t obviously conform to simple supply and demand arguments. See above. Then, we embark on a three-pronged investigation: First, maybe there is something about the situation we don’t understand. Durable institutions and arrangements, despite competition and lack of government interference, sometimes take us years to understand. Second, maybe there is a “market failure,” an externality, public good, natural monopoly, asymmetric information, or missing market, that explains our puzzle. Third, we often discover a “government failure,” that the puzzling aspect of our world is an unintended consequence of law or regulation. The regulators got captured, the market innovated around a regulation, or legal restrictions stop supply and demand from working. Once we understand a puzzle, we are in a position to begin to diagnose a divergence between reality and socially desirable outcomes, and we can start to think of how to improve the outcome. But, though “some” may the world puzzling, or “many” might “voice concerns,” we don’t pronounce until we understand how one of these mechanisms describes the situation. Quantitatively: Cocktail-party externalities need not apply. “I don’t understand it” doesn’t mean “it’s bad.” And since that attitude pervades regulation in general and financial regulation in particular, we do the world a disservice if we echo it. I belabor this point, because I do not offer a competing black box. I don’t claim to estimate the socially-optimal “size of finance” at 8.267% of GDP, so there. Though apparently rhetorically effective, this is simply not how we do economics. After all, if a bunch of academics could sit around our offices and decide which industries were “too big,” which ones were “too small,” and close our papers with “policy recommendations” to remedy the matter, central planning would have worked. A little Hayekian modesty suggests we focus on documenting the distortions, not pronouncing on optimal industry sizes. Documenting distortions has also been, historically, far more productive than pronouncing on the optimal size of industries, optimal compensation of executives, “global imbalances,” “savings gluts,” “excessive consumption,” or other outcomes. Still, the size of finance represents a contentious issue, so let us think about it. The financial services industry has grown a lot, reaching 8% of GDP. Greenwood and Scharfstein (2012) usefully focus the discussion by identifying the two areas of most significant revenue growth: asset management and fees associated with the expansion and refinancing of household debt. Given how much high-fee asset management is in the news, and somewhat envious discussions around faculty lunchrooms and university development offices, it is indeed surprising to learn that the more mundane business of providing consumer credit and residential mortgages, and charging transaction fees, contributed a larger increase in finance-sector revenue, at least up until 2007. Proprietary trading profits don’t even make their list. I won’t delve much into numbers, except to point out how hard measurement is. The difference between GDP, revenue, wages, employees, value added, etc. matters. We really want to know how many resources are devoted to the function of finance, but GDP is based on industry. If a steel company runs its pension fund investments in-house, that activity is counted as part of the steel industry GDP. If the steel company hires an asset management company to run its pension fund investments, now that same activity shows up as finance industry GDP. If an individual shifts his investments to a mutual fund, his investment management activity shifts from home production, not counted at all, to market activity. GDP shows a larger finance industry, though overall resources devoted to money management may decline. And data on the size of finance that ends in 2007 leads to an obvious retort – like the weather, if you don’t like it, just wait a bit. As Greenwood and Scharfstein note, there are many obviously beneficial aspects to the growth of finance over the last 40 years. My grandfather held individual shares of stock. I hold a share of the Vanguard total market index in a 401(k) plan, a much better diversified and much lower-cost form of investment. The much larger participation, diversification, and consequent risk-sharing, plausibly has led not only to better retirement savings opportunities, but to halving of the cost of capital for businesses that issue equity – price/earnings ratios seem to be on a permanently higher plateau, or at least so we hope. The accessibility of housing, student, and consumer finance has become if anything too easy. Let’s instead focus on the contentious issues. Their basic facts seem to scream: The demand for financial services shifted out. People with scarce skills supplying such services made a lot of money. (Portfolio managers, yes. Janitors and secretaries, no.) A system with proportional fees, a common structure in professional services, interacted with stock and home price increases (a different surge in demand) to produce increased revenue. That fee rates did not fall seems hardly surprising when faced with a surge in demand. Why demand shifted out, and why house and stock prices rose (temporarily, it turns out) are good questions. But they don’t have much to do with the structure of the finance industry. Still, let us dig deeper. In particular, I wish to trace what the voluminous recent literature in finance implies for the “size” and “social benefits” question. High-fee active management and underlying active trading has been deplored by academic finance in the efficient-markets tradition for a generation. French (2008) is a comprehensive summary. French estimates that equity investors in aggregate, between 1980 and 2006, paid 0.67% per year in active management fees, which conservatively means 10% of the value of their investments. French, and Greenwood and Scharfstein, note that the increase in management fee revenue lies on top of several offsetting trends. Individuals moved investments from direct holdings to mutual funds, and then to index or other passive and semi-passive funds. Their participation overall increased, and new investors in defined-contribution plans invest almost exclusively in funds. Mutual fund fee rates, came down sharply, in part reflecting the slow spread of very low-fee index and other passive funds, and in part simply reflecting competitive pressure. French reports that the average equity fund fee fell from 2.19% in 1980 to 1% in 2007. Greenwood and Scharfstein report that average bond fund fees fell from 2.04% to 0.75% Some index funds charge as little as 0.07% . Total mutual fund fee revenues reflect these declining rates multiplied by a much larger share of assets under management. So, the behavior of individuals and funds oriented towards individuals does reflect sensible forces, if one is willing to grant a rather long time span for those forces to affect industry structure. High-wealth individuals and institutions moved their investments to even more actively-managed hedge funds, private equity, venture capital, and other even higher-fee and more active investment vehicles. Hedge fund fee rates are reportedly stable over time with 1.5-2.5% management fee plus 15-25% “performance” fee; the fund managers keep 15-25% of the profits above a high-water mark. This part of the market surely offers the more puzzling behavior. Asness (2004) chalks fee stability up to supply and demand: more investors are looking for hedge funds (with great track records) than entrepreneurs are able to set up such funds. That would all make some sense if investors were getting something for those fees. But the aggregate portfolio of equity mutual funds is almost exactly the value-weighted market portfolio, and the average alpha before fees is very nearly zero. (Fama and French (2010) is an excellent tip of this iceberg of research.) The evidence from hedge funds, which struggles with much worse survivor-bias and multidimensional benchmarking issues, still ends up arguing over a few percentage points of alpha one way or the other, hardly the expected gold mine. Mediocre average results might not be surprising. With free entry in any business, the average performer will be average. The average economics professor isn’t that good either. But one might expect that, as in every other field of human endeavor, the good managers would be reliably good. Every manager I’ve ever talked to responds “Sure, the average manager doesn’t know what he’s doing. But we have alpha.” Michael Jordan’s past performance was a reliable indication of what would happen in the next game. In this context, Fama and French’s (2010) more surprising finding is that the distribution of alpha is remarkably small. The sample of mutual fund alpha is only very slightly wider than what one would expect if nobody had any true alpha, and sample results were just due to luck. Fama and French’s estimate (p. 1935) of the distribution of true alpha has a standard deviation of only 1.25% on an annual basis, meaning that only 16% of funds have true alphas (gross, before fees) of 1.25% or greater. And 16.5% have “true alphas” of negative 1.25% or worse. Similarly, study after study finds that past performance, especially long-term average returns, has essentially no power to predict future performance. What persistence there is seems related to the small one-year autocorrelation in underlying stock returns, which random portfolios will inherit. (Carhart (1997)). For 40 years, academic finance has deplored active investing and paying fees for active management. It seems the average investor should save himself 67 basis points a year and just buy a passive index such as Vanguard’s total market portfolio, and the stock pickers should do something more productive like drive cabs. Active management and its fees seem like a total private, and social, waste. On second look, this hallowed view – and its antithesis -- reflect somewhat inconsistent positions. Active management and active management fees have survived 40 years of efficient-markets disdain. If a freshwater economist doesn’t accept “folly” for “explaining” patterns of predictable price movement that survive 40 years, how can he accept it to explain such a stable industry equilibrium? From the other viewpoint, the saltwater consensus that markets are inefficient, and prices are far from “fundamentals” because of various behavioral or limits-to-arbitrage frictions, implies that there is a lot of alpha and there ought to be a lot more (and better) active management. You can’t both deplore the inefficiency of the market and active management that attempts to correct it. “Explaining” active management and fees as folly is certainly inconsistent with my methodological outline: Folly is a name for a residual, not a quantitatively successful theory of active management. We are not, however, at sea with an unfathomable puzzle. Jonathan Berk and Richard Green (2004) have created a supply-demand economic model that explains many of the basic facts of mutual fund performance, flows, and fees. Suppose that some fund managers do have alpha. Alpha, however, has diminishing returns to scale. Traders report that many strategies apply only to smaller stocks or suffer from price impact if they are implemented on too large a scale. As an example, suppose that a manager can generate 10% alpha on $10 million dollars. Suppose also that his fees are a constant 1% of assets under management, and to make it simple assume the stock market value does not change. Thus, in his first year, the manager makes $1 million abnormal return. He pockets $100,000, (1%) and his investors get $900,000. Seeing these good results, investors rush in. But the manager’s idea cannot scale past $10 million of assets, so the manager invests extra money in the index. With $20 million under management, he still generates $1 milllion alpha on the first $10 milllion, and nothing on the rest. He takes one percent of assets under management, now $200,000. But his investors still get $800,000 alpha. More investors pour in. The process stops when the manager has $100 million under management. He still generates $1 million alpha, but now he collects $1 million in fees. His investors get exactly zero alpha, the competitive rate of return. But all are acting rationally. This model explains many puzzling facts: In equilibrium, returns to investors are the same in active and passively managed funds. Funds earn only enough alpha to cover their fees. Good past fund returns do not forecast good future returns. Investors chase managers with good past returns anyway, one of the most-cited “irrational” puzzles about mutual funds. Returns to investors do not measure alpha. Fees do. Managers with good track records get paid a lot. This model doesn’t explain everything. It is predicated on the fee structure, and does not answer why the manager cannot simply charge $1 million fee to start with. (One might view the expansion of hedge funds as implementing exactly this fee innovation.) Fama and French (2010) complain that the average alpha after fees is negative, but their benchmarks contain no transactions costs. Still, this analysis is worth celebrating as an interesting step in the “normal science,” “work harder” response of research to puzzles. After 40 years of unproductively deploring active management and its fees, it turns out a simple supply and demand story can explain many facts. c. Is it silly to pay a proportional fee? If the stock market doubles in value through price appreciation, there is no obvious reason why investment management services in the aggregate would be worth more, or would cost more to provide. I’m tempted to say, “There you go again.” “No obvious reason” means “I don’t know” not “I know it’s too big.” But let’s deeper into this ubiquitous fee arrangement. First, fee revenue is not a good measure of the “size” of finance. If you invest $10 million, agree to pay your hedge fund manager 2+20, and markets double, he pockets $2.2 million. If we followed the standard that we measure GDP in service industries by factor payments, we would call this $2.2 million of extra GDP, $2.2 million of “resources” devoted to “finance.” Greenwood and Scharfstein do not to make this mistake – they call it revenue. But why do we care about revenue? Revenue is not the same thing as social resources consumed. In this case, it’s a pure transfer. It’s better to think of the fee simply as a risk-sharing arrangement among co-investors. We didn’t know that stocks would double in value. At best some measure of the discounted present value of fees should count. Second, if the market doubled in value because everything else did – capital stock, earnings, etc. – then surely by constant returns to scale, the value of investment management (whatever it is) would also double. Thus, if the argument is not just a repetition of the idea that fees should be zero, it must be that fees should not rise with higher valuations -- higher price/earnings ratios, lower discount rates -- in the same way fees should scale with rising cashflows. As well as not being an obvious proposition, such rises in valuation are temporary. Just wait a moment. Third, we have seen in fact a substantial decline in fee rates in mutual funds. The constant fee rate simply did not happen. Last, and most of all, just what do we expect fees to look like? If the current fee structure seems to produce a “too large” finance sector, what’s the optimal contract? What’s the distortion? Greenwood and Scharfstein mention cost, a reasonable benchmark in a competitive market. Fees already scale with cost in the cross–section: mutual funds and hedge fund offer a schedule of lower fees for larger investments, which compensates the funds for the fixed costs of managing any account. So the complaint must be the time series: If you invest (say) $10,000, perhaps you should sign up for $100 per year fees regardless of performance? Why don’t we see this fee structure? One reason is regulation: mutual funds must treat all investors alike. They cannot charge a different fee rate to different vintages of investors. But the deeper reason is that contract is pretty obviously silly. Since most people make monthly contributions, each contribution would have to have a different fee, a nightmare of accounting. Or do they think mutual funds should bill by the hour, passing on “cost” as lawyers do? It’s pretty clear why that doesn’t happen! More deeply, percentage fees pervade professional services, and have done so basically forever. Real estate agents charge percentage fees, and do better when house prices are higher – this is Greenwood and Scharfstein’s second major source of the increasing (until 2007) size of finance. Architects charge percentage fees. Contingency fee lawyers take a percentage of winnings. Corrupt officials take percentage bribes. Salesmen get percentage commissions. In sum, the argument “finance is too big” because fees based on a percentage of assets under management are a big distortion seems awfully strained. At least I’d like to see a specific claim what the alternative, realistic, and privately or socially optimal contract is! Fixed percentage fees can be justified if one [investor and manager] believes that a manager has the ability to create alpha…. But this argument does not hold in the aggregate, since alpha is zero sum across investors. This argument is logically wrong. Alpha sums to zero over all investors. The managers may be the positive alpha investors, and individual investors the negative alpha investors. Current empirical evidence suggests they are not for mutual funds, but it’s not impossible. More importantly, in the end, then, the supposed irrationality of AUM fees comes down simply to the position that nobody should pay any fees at all for active management, because there is no alpha, not that something is fundamentally wrong with the AUM form of the fees. If Berk and Green are right, the whole argument falls apart. d. Where’s the wedge? What is the optimal contract and why don’t we see it? …there are significant distortions in the market for professional asset management arising from investor naiveté (mainly households) and agency problems associated with certain institutional investors (mainly pension funds). These distortions have led to increased use of active asset management and may also have biased active asset managers away from socially efficient forms of information acquisition and asset allocation. … investor naiveté results in more active management and more expensive active management than in a world with sophisticated investors. Individual investors, many of whom actively manage their portfolios and whose decisions in doing so are the stuff many behavioral biases, may be doing a lot better with 1% active management fee than actively managing on their own. As a matter of fact, individual investors are moving from active funds to passive funds, and fees in each fund are declining. Many of their fee advisers are bundling more and more services, such as tax and estate planning, which easily justify fees. At least naiveté is declining over time. Most of all, the naiveté argument is belied by the fact that large, completely unconstrained, and very sophisticated investors are moving to high-fee active management. 500 basis ponts of alpha. Put that in your pipe and smoke it, Fama and French. At least we know one active manager’s perception of what they get for their fees. I only pick on our endowments for fun, and to spark interest among a readership of academic economists. This general approach to portfolio management is pretty much standard at endowments, nonprofits, sovereign wealth funds, family offices, pension funds, and so forth – anywhere there is a big pot of money to invest: These investors pay a lot of attention to allocation among name-based buckets, as represented in the pie charts, “domestic equity,” “international equity,” “fixed income,” “absolute return,” “private equity,” etc. Then, funds in these buckets are each allocated to a group of fee-based active managers, to deliver “alpha” within their style. This overall approach bears no resemblance to standard portfolio theory. Any allocation other than market weights is an active bet. Name buckets make no sense, betas and correlations do. (For example, international and domestic equity are very highly correlated.) And don’t even ask whether hedge fund manager A is shorting what B is buying, what happens to fees when you give a portfolio of managers 2+20 compensation, half of them win, while half lose, or even why we pay the growth manager to buy the same stock that the value manager just sold. Anywhere else in economics, we would ask why people have evolved this widely-practiced set of rough and ready decision procedures. Standard portfolio theory is, in fact, devilishly hard to apply in real-world situations, if one is not going to simply hold the market index. But and vaguely-stated “agency problems” and “naviete” seem an unpersuasive as well as superficial explanation. “Agency problems” means problems in the contract between those in charge – boards of directors and trustees, or the wealthy individual at the head of the family office – and the manager who in turn hires the other managers. But this too is a story. Greenwood and Scharfstein neither explain nor cite a set of essential frictions (e.g. information or moral hazard), and how, as a result, a principal who wants to put it all in the Vanguard total-market index is forced to hire a manager who follows the above “standard” portfolio process. Harvard's endowment was overseen by a high-powered board, including its president Larry Summers, probably the least naïve investor on the planet. The picture that Summers and his board, or the high-powered talent on Chicago's investment committee are simply too naïve to demand passive investing, or that they really want the endowments to sit on the Vanguard total market index, but some "agency problem" with the managers they hire and fire with alacrity prevents that outcome from happening, simply does not wash. Just ask them. (I have.) This is exactly the portfolio and process that the people in charge want! Perhaps the whole world is naïve, but then so are the designers and implementers of regulation when they, like Summers, go to Washington to correct matters. Increasing naïveté and worsening “agency problems” seem even more dubious “explanations” for the increasing share of sophisticated investor’s portfolios in active high-fee investing. As for excessive compensation, in the first layer of fees (fees to the manager who pays fees to the other managers) Harvard endowment’s CIO Jane Mendillo was paid $4.7 million, most of which was straight salary. The University of Chicago’s Mark Schmid gets only $1.8 million, though our measely $5.6 billion AUM relative to Harvard’s $27.6 billion may have something to do with it. If we’re paying this much, is it that much of a puzzle that pension funds do the same thing? Fees are half the puzzle. The other half of the puzzle is, is there any alpha in the first place, and if so, why? Really, the argument over fees came down to the argument that there is no alpha, so nobody should pay any fees at all. If there is alpha, the Berk and Green analysis suggests we may be on our way to understanding fees. Much of the traditional disparagement of active management fees comes down to the view that markets do not permit anyone to earn abnormal expected returns, so active trading itself is a waste of time. The average investor theorem is an important benchmark in evaluating this question: The average investor must hold the value-weighted market portfolio. Alpha, relative to the market portfolio, is by definition a zero-sum game. For every investor who overweights a security or invests in a fund that does so, and earns alpha, some other investor must underweight the same security, and earn the same negative alpha. We can’t even collectively rebalance: If the stock market goes up, so that stocks represent 80% of wealth and bonds 20%, rather than previous 60% - 40% weights, we cannot all sell stocks to reestablish 60/40 weights. For each investor who rebalances, some other investor must overweight stocks even more. Finally, each of us can protect ourselves from being the negative-alpha mark with a simple strategy: hold the market portfolio, and refuse to trade away from it, no matter what price is offered. a. Alpha. Lots of alpha. A slew of “anomaly” strategies generate average returns but do not have large market betas, and so represent “alpha” relative to the market portfolio. Examples include small stocks, value stocks (low market value relative to book value; high “q”), momentum stocks (those that have risen in the previous year), stocks of companies that repurchase shares, stocks with high accruals, and stocks with low betas. The carry trade in maturities, currencies and credit (buy high yield securities, sell low yield securities), and writing options, especially the “disaster insurance” of out of the money put options, also generates alpha. Expected market returns are not constant, but vary over time by as much as their roughly 6% mean and more. The yields to the anomaly strategies also vary over time, further suggesting dynamic trading strategies as well as allocations to assets different from market weights. The “financial constraints,” “financial frictions,” “institutional finance” “price pressure” and “limits to arbitrage” literatures go a step further. Especially when leveraged intermediaries are stressed, prices of nearly identical securities can become large. For example, during the financial crisis, corporate bonds traded at higher prices than their synthetic versions consisting of a treasury bond and a credit default swap. Covered interest parity failed – you could earn a larger return by buying euros, investing in European money markets, and converting back to dollars in the futures markets than by investing in US money markets. More generally, these literatures find evidence for “fire sales,” when stressed intermediaries try to dump large portfolios of assets on the market. Most of these strategies also correspond to broad categories of common movement among securities. For example, if one buys a portfolio of “value” (low price) stocks in the hope of reaping the “value” alpha without risk, one soon discovers the tendency of all value stocks to rise and fall together, leaving risk in this portfolio. Unlike the conventional concept of an “inefficiency” alpha which diversifies away across multiple investments, the “value” alpha requires one to take on additional dimensions of undiversifiable risk. In this way, these strategies represent additional (beyond the market) dimensions of “systematic” risk. For example, Fama and French (2006) summarize the expected returns to value stocks by their varying exposures to a “value factor,” leaving no alpha in a multifactor model. But the value factor represents alpha relative to the market portfolio. Many of the time-varying risk premiums (expected returns) also rise and fall together. The financial crisis was a great time to buy any number of risky investments. The broad brush of facts are not really under debate. Their interpretation is. First, they might indicate old-fashioned informational inefficiency – information, such as inside information, that somebody has, but is not fully reflected in market prices, for technical or behavioral reasons. The common movement of returns makes this argument harder to swallow, however. Second, they might reflect imperfect risk sharing and (often temporary) market segmentation: information is fully incorporated in market prices, but, especially at high frequency, some risks are narrowly held, so command higher risk premiums then they would if all of us were able to participate fully. If the usual arbitrageurs are not around or able to bid aggressively, prices may fall further than they would otherwise, or if all of us were participating directly. Third, they might reflect the multidimensional and time-varying nature of risk premiums in a fully integrated and informationally-efficient market. The capital asset pricing model was built on evidently untrue assumptions, after all, that the world presents iid shocks, risk premiums are constant over time, and the average investor does not have a job, real estate, or other non-marketed capital. For our purposes, we do not really have to take a stand on which of these explanations carries the most weight. For the facts alone, and any of the interpretations, have important implications for the size of finance in general and the size of active management in particular. Many of these puzzles suggest needed investments in institutional development, not just an expansion of existing structures. As a concrete and recent example, consider the “betting against beta” anomaly recently reexamined by Frazzini and Pedersen (2011a,b). Frazzini and Pedersen document that low beta stocks get higher average returns than they should, and high beta stocks get lower returns than they should. Their interpretation is that many investors want more risk than the market portfolio provides (half should, by the average investor theorem), yet leverage is costly to obtain. These investors buy high-beta stocks instead, driving up the prices of these stocks. “Let them buy options, and leveraged ETFs” you might say, but Frazzini and Petersen show the same patterns in these vehicles. This is a narrowly-held risk explanation. Arbitrageurs cannot help: Correcting market prices through better risk sharing needs a mass of investors to change their portfolios and bear more risk. To bring prices back to what they should be, we need low-cost vehicles to bring high-beta investments to the half of the investing public who wants them. We have seen this before. Small stocks were the first big anomaly relative to the CAPM, generating (it appeared) higher average returns than their betas justified. But it was very hard for individual investors to hold a diversified portfolio of small stocks. Arbitrageurs could only do so much, because small stocks move together, so a concentrated portfolio bears undiversifiable risk. Small stock funds were started, which allowed a mass of investors to participate. Those funds fees and expenses now contributed to revenue and measured GDP, in the way that the activities of individual investors holding small stocks did not. But they allowed the risk of small stocks to be widely shared, and the small stock premium to decline. The presence of dozens of “systematic” sources of risk, beyond the market, with substantial and time-varying premiums, has deep implications for asset management, no matter what the ultimate general-equilibrium source of these phenomena, in particular even if they result from time-varying macroeconomic risk and not frictions or inefficiencies. After all, if tomatoes are expensive today, you should put fewer of them in your salad. It doesn’t matter whether the sale comes from a “rational” bad harvest, or an “irrational” bubble in the tomato futures market. Likewise, it behooves an investor to see what risks are on sale today, no matter what their source, or have his manager do so. The conventional disdain of management is rooted in the conventional view of the investment environment, which predated these discoveries. This view describes one source of “systematic” risk, accessible through passive investments: the market portfolio of risky assets. The investor understands this opportunity, and knows how much market risk he wishes to take. Returns are independent over time, so he does not often reconsider his “systematic” risk exposure. If he hires fee managers, their job is to earn “alpha.” In turn, alpha is interpreted only as return available from exploiting “inefficiency,” information the manager has that is not reflected in market prices, diversifiable across individual bets, and winnings from zero-sum gambling with other active managers. In this conventional view, the investor does not need to hedge the risks of job, business, outside income, or peculiar liability stream he is trying to fund. But we have learned that this view of the world is completely wrong. Standard mean-variance (alpha-beta) portfolio advice is upended by the facts as they have emerged. Perhaps some of puzzling investment practice might be understood as a rough and ready way of adapting to the world as it is. In a time-varying world, long-term investment is quite different from short-term investment. As a simple example, consider the riskless asset. A short-term investor holds a money-market fund as his riskless asset, and stays away from long-term bonds. To a long-term investor, by contrast, a long-term indexed bond is the “riskless” investment, exactly the opposite result, and money-market funds expose him to interest-rate risk. The long-term investor does not care about temporary price fluctuations of long-term bonds, as he knows the bond’s value is always the same at his horizon. Now to integrate this fact into the conventional short-horizon perspective, we say that the long-term investor values long-term bonds – despite their terrible one-year mean-variance properties, as a “state-variable hedging” asset. Most investors also have jobs, businesses, or other non-marketeable income streams or fixed liabilities. Such investors should buy assets hedge those streams, and to hedge state variables for those streams. You want a portfolio that rises when there is bad news about your future income, before the bad future incomes arrive. University endowments supporting tenured professors have a risky asset stream, a bond-like liability stream leveraged by tax-arbitrage borrowing, and an important tournament relative to other universities in their objective functions (Goetzmann and Oster 2012). Pension funds have, well, pensions. In turn, this time-varying desire to hedge outside income and state variable risk are prime candidates for economic explanations of the fact that equilibrium asset returns do not obey the static CAPM. If so, all this dynamic trading represents dynamic, socially beneficial insurance. Even to a one-period mean-variance investor, taking advantage of time-varying multidimensional risks (being the insurance-writer) takes technical knowledge. Do you know how to write a CDS contract, get a stock momentum strategy to work without drowning in transactions costs, take advantage of temporarily high put option premiums in the Eurozone, or even reliably buy a “value” portfolio? The nature and amount of multidimensional systematic risk one should take is much more nebulous and difficult to assess than the traditional question, how much market risk one should take. Have you even thought about whether you should be writing put options? Or maybe you should be buying them, as you buy home insurance, despite the premium? Well, if it’s not easy, portfolio problems like this might certainly benefit from professional and specialized management, and such management ought to be able to charge a fee. But in this dynamic buying and selling of multiple dimensions of risk, I do not need to invoke informational “inefficiency” at all, or violate the average investor theorem. Warren Buffett might write a lot of put options (he is), responding to a higher premium, because Chicago is buying them (it is), presumably responding to a risk analysis of the effect of another crash on its operations. This radically different view of the investment environment, and portfolio formation in that environment certainly explodes the traditional view that disparages active management. I do not claim that current portfolio practice, and especially hiring many different high-fee hedge funds, is necessarily an optimal response. But it isn’t necessarily as “naïve” or “agency conflicted” as it otherwise seems, given we really have no concrete better advice to offer. In the quest to explain the persistence of active management and its fees, a second analogy seems worth pursuing: marketing. Marketing and advertising have long been a puzzle to economists, Consumer Reports readers and coupon-clippers everywhere. Why buy the brand name when the generic is just as good – often nearly identical – and costs a lot less? Theorem one of the frictionless theory of finance (the Modigilani-Miller theorem) says that the value of marketing is zero. The value of a portfolio is the value of its ingredients. Yet the money-management industry is essentially a marketing industry: They take the most generic and easily available ingredients you can think of, put them in a package, wrap a nice label on it, and market like crazy. Yes, from this point of view, it’s puzzling that people don’t buy the generic (Vanguard). It’s puzzling that they don’t buy the pieces and assemble their own (etrade). It’s puzzling that they pay quite so much for the slight differences in ingredients that the active managers or closed-end funds deliver. As it is puzzling that they pay for Coke, Clorox, Bayer, or bottled water; that they shop at Macys not Target, Whole Foods not Costco, and a hundred other brand names. It’s not the time to digress into the “rationality” of the entire field of marketing and advertising. But dismissing centuries worth of branding and advertising as simply “naïveté” and folly seems, well, naïve. And perhaps by thinking of mutual fund management as an instance of this larger pattern, we may make some progress to understanding how it actually works. Much trading, and active management, however, is clearly aimed at bringing information to the market, not just better sharing time-varying multiple dimensions of risk or overcoming segmentation. Let us reconsider the social value of that activity. Aren’t all resources devoted to a zero-sum game ipso-facto socially wasted? Aren’t half of the people who don’t index, by definition, deluded? Do we have to rely, as we must in defending the casino industry, on an entertainment value for trading? No. The social point of information trading is “price discovery.” If someone has a piece of information, he buys on that information and his “price impact” makes prices reflect that information. In aggregate, active investors almost certainly improve the accuracy of financial prices. This, in turn, improves society’s allocation of resources. Thus, my estimate of the cost of active investing also measures society’s cost of price discovery. I offer no evidence on whether society is buying too little or too much of this good. Price discovery, however, is an externality—each active investor pays the full cost of his efforts but captures only a tiny slice of the benefit—so there is no reason to think active investors purchase the optimal amount of price discovery. The literature on short-selling is revealing to this point. Actively-trading short sellers uncover far more financial fraud than the SEC, whose performance in the Bernie Madoff case is more typical than you might think. Some of the biggest and most uncontroversial alphas and “inefficiencies” – prices that do not incorporate available information – occur when there is an impediment, technical or regulatory, to the activities of these short sellers. Lamont (2004) finds 2.4% monthly alpha to a portfolio of short-selling constrained stocks, probably the clearest and largest clear informational “inefficiency” around except for inside information. This is a concrete example of inadequate (because constrained) trading. From a social benefit perspective, however, the critical question is not whether active management leads to excess returns—it does not. [On average, in mutual funds.] Rather what matters is whether the pursuit of excess returns produces socially valuable information. So, the question is whether we want prices to be more efficient. Is this useful? The social benefits from efficient markets are difficult to measure. One of the main benefits is that firms can raise new capital at prices that accurately reflect their fundamental value, i.e, that they can raise money in primary markets to fund real investments. Without speculators evaluating Google’s plans and driving the price to stratospheric levels, Google could not have issued stock to fund investments in, say, driverless cars. Certainly, this kind of investment would not be supported by bank lending. Of course, much information discovery is oriented toward trading securities in secondary markets, i.e., trading securities that already exist. This is a good point. IPOs, venture capital, and private equity are important functions of finance, but they do not depend on information trading in established markets. Having an efficient secondary-market price if established firms want to issue additional equity and invest is useful, however. Unlike Greenwood and Scharfstein, I see in the strong correlations between stock prices and investment, over time (through the tech boom and bust of the 1990s and through the financial crisis), and across industries (Google vs., say, GM), a validation of the Q theory of investment (Cochrane (1991), (2011) Figure 10), so long as you don’t difference the data too much. To dismiss the value of efficient markets because a few alternative regressions find that variables other than Q help to predict investment – and in the absence of a compelling theory why investment should be disconnected from asset markets, for the large, unconstrained, firms who regularly access those markets and account for the bulk of investment – seems again to take a puzzle as fact a bit too quickly. For example, a hedge fund may be willing to pay $20,000 to form a more accurate prediction of a company’s earnings to be released in the next week… in an exchange economy without production,… the $20,000 is a social loss because getting this information into prices one week earlier is unlikely to lead to a more efficient allocation of real resources. I.e., the firm is unlikely to issue equity during the week. This is an important example to think about. Here, I think Greenwood and Scharfstein miss a second main function of asset markets: risk sharing. Efficient markets have social value, even in an endowment economy. For example, if I own tree A, and you own tree B, we want to sell each other shares of the trees in order to share risk. An inefficient market will impede this process. You can increase utility without changing production, by changing the allocation of production. More generally, the attractiveness of stocks to fundamental investors – the ones who did fund the initial public offering – depends on the stocks’ liquidity, the confidence that these investors can quickly sell those stocks at the “right” price when they feel like exiting. The whole rationale for most securities market regulation – even regulation that makes markets less efficient, such as the ban on insider trading -- is precisely this idea that the retail investor should face a “fair” and liquid market is based on this idea. And we all see the advantage of less volatile markets. Yet it is exactly the activities of traders, such as in Greenwood and Scharfstein’s example, which minimize volatility. Any predictable price movement – any violation of the random walk – adds volatility. The view that trading is socially beneficial only if it directly finances “real” investment, if taken seriously, would imply dramatic changes in asset markets. Most derivatives are clearly zero-sum, zero-net supply bets. The dangerous idea that credit default swap trading should be banned except by holders of the underlying security would follow. Political prediction markets, recently endorsed by perhaps the most distinguished set of coauthors ever to write an economics article (Arrow et. al (2008)), ought to be banned (as the CFTC just did). Interestingly, markets dreamed up by economists to benefit risk sharing – such as Robert Shiller’s GDP futures markets, or hurricane catastrophe options – do poorly. Liquidity for risk-sharing investors seems to depend on the presence of high-frequency information traders. Yet Greenwood and Scharfstein’s example is telling. To make it more vivid, suppose that the fund got the earnings announcement 5 minutes before release. “Price impact” is nebulous, but in the efficient-market extreme that it can buy all it wants, the firm could appropriate the entire increase in company value – and more, in options markets – based on the information. In turn, it would be willing to expend real resources covering almost all that value in order to get the information. Which clearly is a social waste – having the price rise (if it does!) 5 minutes earlier is not worth expending the entire change in value of the firm. I conclude that information trading of this sort sits at the conflict of two externalities / public goods. On the one hand, as French points out, “price impact” means that traders are not able to appropriate the full value of the information they bring, so there can be too few resources devoted to information production (and digestion, which strikes me as far more important). On the other hand, as Greenwood and Scharfstein point out, information is a non-rival good, and its exploitation in financial markets is a tournament (first to use it gets all the benefit) so the theorem that profits you make equal the social benefit of its production is false. It is indeed a waste of resources to bring information to the market a few minutes early, when that information will be revealed for free a few minutes later. Whether we have “too much” trading, too many resources devoted to finding information that somebody already has in will be revealed in a few minutes, or “too little” trading, markets where prices go for long times not reflecting important information, as many argued during the financial crisis, seems like a topic which neither theory nor empirical work has answered with any sort of clarity. The classic theory of finance predicts that information is perfectly reflected in prices, with no trading volume. Every uninformed investor holds exactly the market index. He only buys and sells the entire index, when he wants to save or consume. In part, this is his defense against being the negative-alpha half of the average-investor theorem. Anyone offering to trade individual stocks must know something. And if the “uninformed” investors would only behave this way, then informed investors could make no money from their information. French’s public good analysis is perfect. Prices reflect information with zero trading volume and zero profits for informed investors. Once again, the classic theory of finance is dramatically at odds with the facts. Yet the facts are so durable that “folly” seems hardly persuasive, and in any case a poor predictor of the fascinating patterns we see in empirical work on volume and trading patterns. The classic theory also ignores costs. If information traders cannot earn positive alpha, and, if producing information and trading on it takes any time and resources, the information traders won’t bother, and nobody is left to make prices reflect information in the first place. So, as Grossman and Stiglitz (1980) wrote, informationally efficient markets are impossible. Markets must be just inefficient enough to provide rewards for price discovery. But how? How do we overturn the no-trade theorem? Why are any of us “passive” investors are willing to take the other side of the “active” investors and suffer negative alphas? Models of information trading posit “liquidity traders,” who take positions in individual securities for unspecified reasons. But who are they, really? Other models (Scheinkman and Xiong (2003) for example) posit slightly-irrational dogmatic beliefs, to unwind the recursion by which if you make an offer to me, I update my view of the asset’s value and refuse to trade. Then we can have markets with traders, each of which does believe he’s smarter than average. Many trading models, such as Acharya and Pedersen (2005) simply write down overlapping generations of agents without bequests who die every two days or so, to force them to trade. All these assumptions are obviously convenient shortcuts for getting trading into the model for other purposes, such as studying liquidity, but they are not really fundamental descriptions of the trading and price-discovery process. Yet the fact staring us in the face is that “price-discovery,” the process by which information becomes embedded in market prices, in our world, uses a lot of trading volume, and a lot of time, effort and resources (GDP). The empirical literature offers many tantalizing glimpses. There is often a period after a news announcement, of high price volatility and trading volume, in which markets seem to be fleshing out what the news announcement actually means for the value of the security. For example, Lucca and Moench (2012) Figure 6 show an enormous spike in stock-index trading volume and price volatility in the hours just after the Federal Reserve announcements of scheduled Open Market Committee interest-rate decisions. The information is perfectly public. But the process of the market digesting its meaning, aggregating the opinions of its traders, and deciding what value of the stock index should be with the new information, seems to need not just bidding, but actual shares to trade hands. (Banerjee and Kremer (2010) and Kim and Verrecchia (1991) offer models in which “disagreement” about public information leads to trading volume.) Perhaps the whole model of information, we all agree on the deck of cards, just not knowing which one was picked, is wrong. The markets we see are set up, and exist, almost entirely to be markets for information trading. They are not markets for securities. We could easily handle individual’s lifetime saving and dissaving needs, and firms’ need to issue and retire equity, in much sleepier institutions such as a bank. Exchanges exist to facilitate price discovery, and that discovery comes with a vast amount of trading. Options were invented largely to facilitate information trading – highly leveraged positions without defaults. And they have existed this way, for hundreds of years. Though we may not yet understand how it works, is the existence of the NYSE and its volume of trading ipso-facto testament to human folly and naïveté? How do folly and naïveté begin to explain the interesting empirical patterns? As we think about the vast bulk of trading, and high-frequency trading in particular, however, I think that Greenwood and Scharfstein’s insightful example, and the vast literature it represents, is fundamentally misleading. The amount of trading that is actually based on a well-understood, “fundamental,” piece of information about a company’s cashflow is minuscule. Models in which an informed trader posesses a “signal” about the value of a liquidating dividend just don’t describe the vast majority of trading. High frequency traders do not make money by trading on earnings reports 20 milliseconds ahead of the market. High frequency traders – and even most “low frequency” day and week traders -- look at patterns of prices, volumes, and past trading activity, not signals about firm fundamentals. Their “information” consists of something else. If you ask them, they say they are acting as “market makers,” “liquidity providers,” making money off the bid-ask spread offered to uninformed “liquidity traders,” and trying hard to stay out of the way of the few traders that do have real “fundamental” information. If you ask their critics, they are artfully front-running demand from less sophisticated investors, removing “liquidity” and worsening “price impact,” i.e. removing the economic rewards to genuine information trading, worsening French’s “public good” problem and simply stealing from informed and liquidity traders. However we come to understand these issues, the social costs and benefits of high frequency trading are clearly not at all related to the minor (as a fraction of GDP) resources devoted to them – the cost of useless fiber-optic cable, co-located servers, and the time of smart programmers who could be developing better iphone games. The social question for high-frequency trading is whether it screws up markets, or whether it provides needed “market-making” services. A “government failure” may be partly to blame. The regulators (SEC, CFTC) require that prices must jump in discrete intervals – once 1/8 dollar, now 1 cent. They require that limit orders are fulfilled in time order: if order A arrives before order B, order A must get filled completely and B gets nothing. But regulators do not discretize time, as they discretize price. A need only get there a nanosecond before B to get the entire order. (Rather than placing orders quickly, the ability to cancel limit orders that are in the back of the line if execution starts to be “too fast” may be one of the advantages of very high speed.) These rules may have made sense in the era of human traders, and came unglued with electronic trading. The incentive to spend too much money on speed in this game is obvious. As is a solution (if my hunch proves correct by more careful theory and empirical work): Suppose that an exchange operated on a discrete clock, as a computer does. It could run a once-per-second, or even once-per-minute, or once-per-hour matching process. Within the time interval, limit orders accumulate. They are not shown, so that responding to the order book does not become the new game. Then orders are matched once per second, with all orders received during the second treated equally. If there are more buy than sell at the crossing price, orders are filled proportionally. Such an exchange would eliminate high frequency trading. Now there would be no need to act faster than a second. Would it work better, and not have other problems? Would exchanges choose such systems if they were allowed to? Is there a force (the powerful influence of high-speed traders) that would keep exchanges from adopting such systems voluntarily, so it would have to be imposed by regulation? The Taiwan stock exchange already matches limit orders once every 90 seconds. (Barber, Lee, Liu, and Odean (2009).) Is its performance atrociously worse? These are all good questions. The facts revolving around the size of housing finance seem much easier to digest. The big increase came in fees associated with residential loan origination and refinancing. Once again, much of this increase seems easily digested as the response to an increase in demand. The increase in demand – the housing boom – may indeed not have been “socially optimal.” (!) Here, Greenwood and Scharfstein echo many other critics of government policy for stoking the housing boom: “…the U.S. tax code – mainly through the mortgage interest deduction – already biases households towards investments in housing over other types of investments. Making mortgage credit cheaper and more available may have just exacerbated this bias.” Add low interest rates, the community reinvestment act, Fannie and Freddie, and the whole sordid cast of characters. The large fees collected for refinancing mortgages (rather than originating and securitizing them) are a bit more puzzling. US mortgages are strangely complicated, and quite different from mortgages around the world. We feature fixed-rate mortgages with no prepayment penalty, and a complex refinancing option that requires reassessment of the property, fees, points, and therefore consumers to solve a complex option-exercise problem. We could surely do things more simply. But not to digress too much, collecting fees when interest rates decline or consumers exercise the option to lower housing equity is not GDP, (except to the extent that the fees represent time required to fill out endless forms), it’s simply collecting on the complex terms of an option contract. Now, that’s not the whole story, as there was a lot of financial innovation surrounding mortgage finance, some of which notoriously exploded. “We raise concerns about the… fragility of the shadow banking system that facilitated this expansion.” Me too. And once again, fragility is the issue, not share of GDP. A concrete example may help. A mortgage-backed security is a pool of mortgages. Suppose that such securities were bundled together into mutual funds, held at floating value or exchange-traded, just like equities, in your and my retirement accounts and our endowments’ investments. This structure would be a terrific financial innovation. Though mortgage-backed securities are a bit opaque, they are nowhere near as opaque as the entire balance sheet of, say, Citigroup. So, the monitoring and information functions we ask investors to play are much easier for a pool of mortgages than for Citigroup equity. Furthermore, such a structure would be immune to runs, bankruptices, needs for bailouts and so forth, just as equities are. The fees required to fill out the mortgage-backed security paperwork vs. the costs of bank paperwork are a tiny issue. Now, this is not what fell apart in the financial crisis. Mortgage-backed securities and their “tranches” were held, not by floating-NAV mutual funds, but in “special purpose vehicles,” funded by rolling over very short-term debt. This structure looks like a traditional bank, whose assets are mortgages and whose liabilities are short-term debt, bank deposits. With a big exception: where is the equity, which is supposed to bear losses in the event the assets don’t work out so well? The answer is, that the special purpose vehicles also had an off-balance-sheet guarantee from sponsoring banks. So the banks really were holding credit risk after all. But regulations did not place capital requirements on off-balance-sheet guarantees. So one function of the whole “shadow bank” was to create an actual “bank,” but evade capital requirements. Whether or not we spent a bit more or less of GDP filling out forms and paying fees for these structures is clearly the least of its problems. The shadow bank was prone to a textbook systemic run, which is what happened. Now, what category of problem is this? Is it an externality, public good, asymmetric information or other “market failure?” No, this seems like a clear case of “government failure,” unintended consequences of poorly structured regulation. A question for another day is whether multiplying by a factor of 10 the size of the regulatory structure – at considerable cost in resources – will prevent or exacerbate this problem. At least we know where the problem lies. V. Runs, “shadow banking,” and the size of transactions finance. 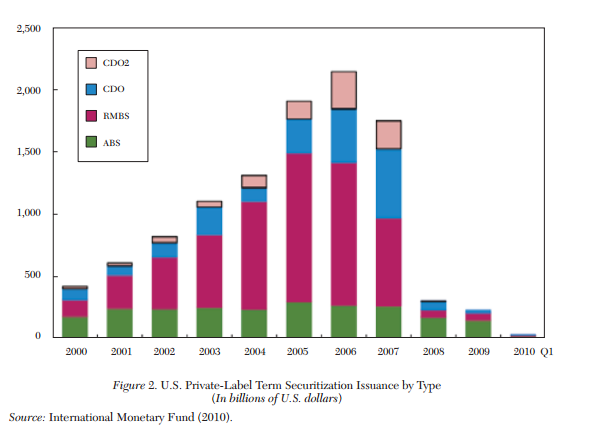 The mention of “shadow banking” brings up a long literature on the “size of finance” that has not been mentioned yet. The issues go by the words “welfare costs of inflation,” or “optimum quantity of money,” but the central issue is the same. In a monetary economy, it is in everyone's private interest to try to get someone else to hold non-interest-bearing cash and reserves. But someone has to hold it all, so all of these efforts must simply cancel out. All of us spend several hours per year in this effort, and we employ thousands of talented and highly-trained people to help us. These person-hours are simply thrown away, wasted on a task that should not have to be performed at all. High interest rate (high inflation) countries spend notoriously large resources on money changing and banking services in an effort to reduce interest costs. Lucas (2000) approaches the question, not by adding up estimates of the services used to avoid holding money as we have, but by calculating the area under the M1 demand curve. He concludes that “the gain from reducing the annual inflation rate from 10 percent to zero is equivalent to an increase in real income of slightly less than one percent.” “Finance” under a 10 percent inflation rate is “too big” by 1% of GDP, from this clear distortion. Lucas did not go further to estimate the benefits of reducing the nominal interest rate to zero, as when he wrote there was not much data from this regime. Depending on the rate of increase of money demand as interest rates go to zero, the area under the demand curve can be enormous. The fact that banks have increased excess reserves from about $6 billion to about $2 trillion as interest rates have fallen essentially to zero suggests that large welfare costs may have been the case. In this context, part of the function of the “shadow banking system,” special-purpose vehicles, auction-rate securities, overnight repurchase agreements, or money market funds with risky assets (Reserve fund’s large Lehman holdings), like that of the old-fashioned banking system which created deposits, was that its liabilities were, to investors, cash-alternative assets – fixed value, first-come-first-serve accounts, paying some interest greater than zero. Rather than focus on its assets, mortages or mortgage-backed securities, perhaps we should focus on the optimal size, social benefits and costs of these liabilities. Shadow-banking securities allow investors to avoid the needless interest costs of holding money, which is socially useful. But there is a better way to achieve the same outcome: a zero nominal rate, or money that pays interest. Relative to that benchmark, the costs of setting up the shadow banking system, for the purpose of providing interest-paying money, are wasted. More importantly, shadow-banking assets are prone to runs, which is an order of magnitude larger social cost. In any case, following the 2007-2008 financial crisis, and perhaps more importantly the collapse of short-term interest rates to zero and the innovation that bank reserves pay interest, this form of “shadow banking” has essentially ceased to exist. RIP. Furthermore, we could easily insure that the unstable parts of “shadow banking” do not come back. We can live the Friedman optimal quantity of money. The Fed can continue to pay market rates on reserves, even as interest rates rise. The Treasury can expand its plan to issue floating-rate debt, to issue floating-rate, fixed-value debt. This debt works like a money market fund: it has a constant redemption value of 1.00, interest is set on a floating basis, perhaps monthly. Our economy can be costlessly satiated in liquidity. No resources at all need to be directed to economizing on the use of liquid assets, no resources at all need to be directed to the creation of private substitutes for interest-paying government money. The remaining interest cost of money applies only to actual cash, most of which is held overseas or illegally anyway. (US currency outstanding is about $1 trillion, which divided by 300 million is $3,300 per person, and 75% of which is $100 bills. What’s in your wallet?) And no resources need to be devoted to trying to stop, regulate, or clean up after, the runs which shadow-banking assets are prone to. There will still be an incentive to try to issue “money-like” securities at slightly higher yield, by investing in riskier securities. Such securities would still be fragile and run-prone, which is a clear market failure. Once the economy is satiated in liquidity, the need to provide liquid assets need no longer restrain regulators from insisting that any intermediary must offer investments at floating value, and thus immune to runs. Banks do not even need to be allowed to issue deposits to fund mortgages, and can be required to issue arbitrary amounts of equity or long-term debt instead. The run-prone nature of the financial system – surely its largest cost – can easily be solved. The emerging actual future, under Dodd-Frank, is a very highly regulated banking and shadow banking system, with a great deal of regulatory protection for incumbents. After all, too big to fail is too big to compete. The Fed is planning to reduce the interest rate on reserves, and the Treasury is not planning to issue fixed-value debt, so the shadow-banking system is likely to reemerge. This structure seems unlikely to produce much of an increase in efficiency – decline in fees and costs-- necessary to transfer an investor’s savings to a borrower’s investment. Whether it solves the “fragility” issue, especially in the era of looming sovereign debt crises, is a matter for another day. Greenwood and Scharfstein’s big picture is illuminating. The size of finance increased, at least through 2007, because fee income for refinancing, issuing, and securitizing mortgages rose; and because people moved assets to professional management; asset values increased, leading to greater fee income to those businesses. Compensation to employees in short supply – managers – increased, though compensation to others – janitors, secretaries – did not. Fee schedules themselves declined a bit. To an economist, these facts scream “demand shifted out.” Some of the reasons for that demand shift are clearly government policy to promote the housing boom. Some of it is “government failure,” financial engineering to avoid ill-conceived regulations. Some of it – the part related to high valuation multiplied by percentage fees – is temporary. Another part – the part related to the creation of private money-substitutes – was a social waste, has declined in the zero-interest rate era, and does not need to come back. The latter can give us a less fragile financial system, which is arguably an order of magnitude larger social problem than its size. The persistence of very active management, and very high fees, paid by sophisticated institutional investors, such as nonprofit endowments, sovereign wealth funds, high-wealth individuals, family offices, and many pension funds, remains a puzzle. To some extent, as I have outlined, this pattern may reflect the dynamic and multidimensional character of asset-market risk and risk premiums. To some extent, this puzzle also goes hand in hand with the puzzle why price discovery seems to require so much active trading. It is possible that there are far too few resources devoted to price discovery and market stabilization, i.e. pools of cash held out to pounce when there are fire sales. It is possible that there are too few resources devoted to matching the risk-bearing capacities of sophisticated investors with important outside income or liability streams to the multidimensional time-varying bazaar of risks offered in today’s financial markets. Surveying our understanding of these issues, it is clearly far too early to make pronouncements such as “There is likely too much high-cost, active asset management,” or “society would be better off if the cost of this management could be reduced,“ with the not-so-subtle implication ( “Could be?” By whom I wonder?) that resources devoted to greater regulation (by no less naïve people with much larger agency problems and institutional constraints) will improve matters. Acharya, Viral V. and Lasse H. Pedersen, 2005 “Asset pricing with liquidity risk” Journal of Financial Economics, 77, 375-410. Adrian, Tobias, and Adam B. Ashcraft, 2012, “Shadow Banking Regulation,” Federal Reserve Bank of New York Staff Report 559. Asness, Clifford, 2004, “An Alternative Future Part II: An Exploration of the Role of Hedge Funds.” Journal of Portfolio Management 31, 8-23. Barber, Brad M., Yi-Tsung Lee Yu-Jane Liu, and Terrance Odean, 2008, “Just How Much Do Individual Investors Lose by Trading?” The Review of Financial Studies 22, 609-632. Berk, Jonathan B. and Richard C. Green, 2004, “Mutual Fund Flows and Information in Rational Markets,” Journal of Political Economic, 112, 1269-1295. Berk, Jonathan B., 2005. “Five Myths of Active Portfolio Management," Journal of Portfolio Management, 31, 27-31. Berk, Jonathan and Richard Stanton, 2007, “Managerial Ability, Compensation, and the closed-end fund discount” Journal of Finance 62, 529-556. Carhart, Mark M., 1997, “On Persistence in Mutual Fund Performance,” Journal of Finance 52, 57-82. Chevalier, Judith, and Glenn Ellison , “Risk Taking by Mutual Funds as a Response to Incentives,” Journal of Political Economy, 105, 1167-1200. Cochrane, John H., 2011, “Discount rates,” Journal of Finance 66, 1047-1108. Cochrane, John H., 2012, “A mean-variance benchmark for intertemporal portfolio theory,” Manuscript, University of Chicago. French, Kenneth R., 2008, “Presidential Address: The Cost of Active investing” The Journal of Finance 63(4) 1537-1573. Fama, Eugene F., and Kenneth R. French 2006, “Dissecting Anomalies” Journal of Finance 63 (4) 1653-1678. Fama, Eugene F. and Kenneth R. French, 2010, “Luck versus Skill in the Cross-Section of Mutual Fund Returns” Journal of Finance 65, 1915-1947. Friedman, Milton, 1969, The Optimum Quantity of Money and Other Essays. Chicago: Aldine. Gorton, Gary, and Andrew Metrick, 2012, Journal of Economic Literature 50, 128–150. Kim, Oliver, and Robert E. Verrecchia, 1991, “Trading Volume and Price Reactions to Public Announcements,” Journal of Accounting Research 29, 302-321. Kyle, Albert S., 1985, “Continuous Auctions and Insider Trading,” Econometrica 53, 1315-1336. Lucas, Robert E., Jr., 2000, “Inflation and Welfare,” Econometrica, 68, 247–274. Lucca, David O., and Emanuel Moench 2012, “The Pre-FOMC Announcement Drift,” Manuscript, Federal Reserve Bank of New York. Milgrom, Paul, and Nancy Stokey, 1982, "Information, trade and common knowledge," Journal of Economic Theory 26, 17-27. Scheinkman, Jose, and Wei Xiong, 2003, "Overconfidence and Speculative Bubbles," Journal of Political Economy, 1183-1219. Weller, Brian, 2012, "Liquidity and High Frequency Trading," Manuscript, University of Chicago Booth School of Business. The financial sector has grown because in an era of regulatory capture there is a better ROI on crony capitalism than true capital investment and being a middleman pays far better than being either the provider or user of capital. Your general point is that the market does many things, and to judge right or wrong outcomes necessarily entails bringing subjective opinions on what the counterfactual situation might be. That's fair enough. Consider a much simpler question in the same vein. Real estate agency fees. They seem like a bit of a waste. Buyers should easily find sellers cheaply and the industry should have disappeared by now. Yet for some reason, in the US, the industry manages to convince people of its value and skim 6% of the home value per transaction. Yet the market is essentially as competitive as one can get. So, over here in Australia, people got fed up with this and governments began to set maximum commission rates for selling homes at 2.5% of the sale price. And guess what? The industry chugs along nicely selling homes for less than half the cost to society. The question I put to you is what sort of market failure did this regulation correct? Your article simply says that finance is a service, people want it, and if it's unregulated then we must be at a socially desirable outcome. How could it survive decades of competition if it is not? For this argument to hold, as I said in my opening paragraph, you need to bring some subjective opinion about the counterfactual to the table. For me it is that regulation can decrease the cost financial services to society, and the Australia experience with real estate fees shows this to be the case. However, you must hold some subjective counterfactual in your head where reducing the ability of the financial industry to skim fees from transactions is likely to cause some detrimental outcome. Which is a belief that seems to be reflected in your opening swipes at advertising. You imply that all this advertising must be socially beneficial because no one complains. Yet regulations already exit for the advertising industry to reduce the social cost (advertising to children, deceptive conduct etc), and I'm sure there are many groups out there who are concerned with furthering this regulation. My only reply would be that a single outlier, (or even a few of them ) would not be enough to convince me that most government regulation is (A) unnecessary (B) expensive (c)serving of special interest or (D) counterproductive, because my entire adult life in industry and all of my observations have convinced me of this. Which is not to say that all regulation is bad, only the vast majority of it. With regards to the real estate agents fees, if what you say is true then you should also favor the government setting "just" prices on everythinh. You are basically saying that competition is a myth, and "society" is at the mercy of some group of people who can charge whatever they like. If the fees are so high without reason, then more agents will come to the market and bring the fees down. Otherwise, the same principle would apply to everything. What is so special about real estate agents? Maybe all the shoemakers are colluted, so government should set a "fair" price for shoes. $ 50 each pair, thats it, would you favor that? Here is how it works: Real estate agents can not charge whatever they want because of competition. They could only do so with special prerogatives from government. Government has the legal monopoly to use force, and ultimately is the only one that can create monopolies. I think the real issue is that the financial industry is vastly over regulated. Layers upon layers of state regulations, IRS, ERISA, SEC, CFTC, Federal Reserve, Treasury, etc. create massive rent seeking and agency problems. Perhaps in another world there would only be private firms, checking accounts and annuities. Dr Cochrane, thank you so much for this article. It places the argument in perspective. Seems to me you are saying that taxes to pay for decent health care and education for all could be a lot higher without hurting anyone, as people are now just spending the money on stuff they don't need. 1) How do you know they dont need them? I mean, If they cant realize they dont really need them, then how can you? 2) What does "need" have to do with "equality" that the left is always talking about? First Anon...have you considered that (unseriousness aside) those who are primarily wasting their money are the same who are not adequately insuring health outcomes and not saving for college...And you want the rest to pay higher taxes to address this? Wow! Thank you for this excellent article. In many ways I think we should not be too surprised that people deviate from the average investor portfolio. The average investor surely constitutes a set of measure zero in society once we take into account individual circumstances and non-marketed capital and income streams. Investors seek exotic beta, but how much should it cost to get it? If I write a computer program that targets small cap value, is that really worth 2+20, or is this really just another form of “passive” investing that should cost 0.2% in a competitive market? It seems to me that an awful lot of what goes on in the hedge fund world (exotic beta) is just algorithmic option writing strategies and I am not sure that in and of itself that's worth 2+20. Perhaps there is an exotic taste layered on exotic beta for which people are willing to pay. I know analogies are weak in scientific investigation, but it seems to me not too different from medical doctors and patients who insist on treatment for conditions under which only time and rest has any real demonstrable therapeutic value. Ignoring market distortions in medicine, doctors are captured by their technical training and want to treat, and patients want to know that everything that can be done is being done. A lot of effort is spent on treatment with little or no efficacy to satisfy an exotic taste. Is finance really that different? The mutual funds get small rates because they typically revert to the mean market return minus fees - so investors flock to low fee funds. In the case of your computer program, if it truly delivers real alpha (as opposed to beta) then 2+20% could be justified - the value is the alpha generated, not the work put into the strategy. Anonymous, I have to respectfully disagree. Earning alpha is a relative statement - the measurement is with respect to some reference portfolio. But that doesn't mean alpha is the result of skill, it just may mean that the active fund is exposing itself, as Professor Cochrane put it, to another dimension of risk (exotic beta) not reflected in the reference portfolio. How much should it cost to get that exposure? I agree that investors should pay to get exotic beta and I think we should simply accept the market clearing price for it. But as a particular form of beta becomes better understood, and a computer program can generate the exposure, shouldn't a competitive market drive that cost down to the level of the fees for buying the index? Unless there is an exotic taste going on or some weird market distortion, I can't see how this isn't the end state. From the multidimensional source of risk viewpoint, there is no alpha, only beta - what people call alpha is the beta they don't understand. What I like about your writing and blogging is the humor. The reference to Kim Kardashian. The snide comment about programmers employed by HFT firms being freed to write more iphone apps. Love it! Wow, what a fabulous essay. I'm not a finance expert (some undergrad business classes are all the background I have), but this essay was very accessible and clear. Its not the total size of the financial industry that is the problem. Its the fact that most of the financial capital is concentrated in the biggest 12 banks that also happen to have access to the Fed's discount window. Its the smaller community and mid-sized banks providing capital to main street that the economy needs, not the massive casino banks. Also, its the financial system that is a problem. Is it really ok that banks are so leveraged that they depend on overnight loans between one another? Of course eventually from time to time, for one reason or another the credit market freezes and panic ensues. The banks are then bailed out by the FED and/or government. Is it really ok that the failure of one massive bank can threaten the entire global economy? Mega-banks can only exist with the support of central banks. Why is it that almost all economists agree that trying to centrally plan the entire economy soviet union style is folly, but centrally planning the financial aspects of the economy is not only possible, but required? Too many unintended consequences. I seriously doubt that the centrally planned financial system will ever be reformed from within. Too bad. Maybe after a mother of all crashes something MAY be done to defang the system, but even that's a big maybe. if you pursue and then provide others happiness, even transitory and empty vs other happiness, they will part with money. I work in academia at a prestigious medical school. A few who have these discussions and not in a one sided way, are always amazed that they never grasped the operating principals (the others are too busy telling everyone how the world SHOULD be, and how the state can force an intervention to make it so, rather than how the world IS and how we can adapt better to its principals, understand them, and exploit them for our and others benefits). in the examples above, an anthropologist just dont make many people happy. the business teacher makes a lot more people happy as what he teaches increases returns in their lives on a monetary scale. the morally superior arts and sciences people (of which i am one on the edge), want what they consider important to get more value, which is why so many of them favor Marxist ideas. its the only system that pretends to be able to change the valuation system (and they assume it would be what they want it to be). however, i don't think anthropologists earned more in the soviet union either. why does an actor or an actress make 40 million a year? because they will make 30 million happy in a day world wide at 8 dollars a pop and more. its actually interesting to note that on a per person valuation, the teacher comes up higher, as they get more X per unit student than an actor gets per unit viewer. Its just that they dont have the volume. This is an extremely good article. Maybe it's just that I haven' kept up with the finance literature, but I learned a lot. I'll write some comments now, in case I don't get to finishing the article till too late for comments to be of use. Sorry if this comment is too long (I didn't keep it short"), but in academia, no serious comment is too long--- free disposal, after all--- and I am writing towards Prof. Cochrane and other academics. p.2, top. I would add something like "systematic misunderstanding" as a reason for market failure. The behavioral economics people are quite correct that dumb, predictable mistakes are a source of market failure. In finance, their effect is more questionable than in most markets, because of arbitrage, but systematic misunderstanding (or some better term you might think of) still has to be on the list of market failures. As with externalities and the others, you can't just wave it on a sign and go straight to regulation; you need to explain the particular mistake, why people make it, and why the market doesn't correct it. And, of course, you then need to worry about government failure. But it ought to be on the list. p. 3. Your grandfather. What has happened is that the price of investing has gone down over the last 40 years, where we must include transaction costs in the price. We should expect the quantity demanded of investment assets to rise, in proportion to the decline in price (e.g., the price has fallen more for exotic securities (which had to be self-assembled), mortgages, small companies relative to Dow Jones stocks, foreign stocks). In theory, the effect on the size of hte finance INDUSTRY is ambiguous, since the falling costs could have meant that all the brokers went bust and everybody invested in a computer-run index fund. But it seems that it went the other way: Wall Street services have become cheaper, but the elasticity of demand is greater than one. The way I just put it, the demand for financial services did NOT shift out, which is what you say. Rather, the supply shifted out, driving the equiloibrium price down, so that the QUANTITY DEMANDED rose even though DEMAND stayed the same. There might have been a demand shift too, as a separate thing. For example, with increasing prosperity, maybe the amount and fraction of savings has risen. p. 5. Fama-French. Maybe to find a profit opportunity both talent AND luck are needed. Suppose talent is about equal for the Wall Street wizards. Luck in any given year is not. Each year, a different mutual fund would do well, but all the wizards would get the same pay (if nothing else is going on). They are all highly paid, since they are highly talented, but the smart money knows that any one year's result is due ot luck. Well, not quite. If a supposed wizard goes 10 years without a good year, then the investor realizes the wizard just talks a good game and probably missed his lucky chance a couple times, and he fires him---- and that would help explain bonsuses in good years too. It would like a generic NFL tackle. Sometimes he gets lucky, a hole opens, and he sacks the quarterback. It's a different tackle every time, though. If a tackle never gets a sack, he is fired. They all perform about the same in equilibrium, and they all get paid a lot. This doesn't mena, however, that John Cochrane could offer to work as a tackle for $10,000 less and the team would hire him. What few if any know, is that as part of its cash management obligations, Braeburn, and AAPL by extension, has conducted a mindboggling $600 billion worth of gross notional trades in just the past four years, consisting of buying and selling assorted unknown securities, or some $250 billion in 2012 alone: a grand total which represents some $1 billion per working day on average, and which puts the net turnover of some 99% of all hedge funds to shame! Finally, there is the minor question of who exactly is it that executes these trades, or, in other words, which are the banks that have pocketed billions in commissions on AAPL's furiously traded portfolio? This post is highly ill-informed. AAPL has built up significant cash on their balance sheet. Whether that is good or not, they do have to manage it. Typically, those cash assets are commercial paper or treasury bills of short maturities (3 months). They need to be rolled, roughly 4 times a year. It ain't "furious" just reality. "We start with the first welfare theorem: loosely, supply, demand and competition lead to socially beneficial arrangements." Wrong. So "loosely" it isn't even close. Excludes "in the absence of externalities." The supply of cheap money which drove valuations sky-high, and continues to do so, is the elephant in the room. Micro factors like structure and size of management fees are relevant for sure but hardly the driving force behind finance industry expansion. As for business schools and professor's compensation, particularly in finance, constant tuition fee growth and ever increasing demand for MBA degress could not have happened without the significant increase of student loan debt which again has to do with cheap money. The stock and student loan bubbles will burst once interest rates begin to climb. As someone who works in the asset management industry, its always struck me as odd that observers tend to forget that this industry is an enourmous exporter of services because US firms (and UK firms also) have been tremendously successful in gaining market share around the globe. Pensions and sovereign wealth funds and wealthy individuals worldwide disproportionately use asset managers in the these locales. For instance, in hedge fund more than 50% of the industry sits with 50 miles of my office in NYC. I suspect that much the same is true for other areas of finance that are global. So, I think part of the problem is that the numerator (US finance) is not really comparable to denominator (US GDP). It would be like noting that coffee production is "too much" of Columbia's economy, oil is "too much" of UAE's or banking was "too much" of Switzerland's. What you are measuring is the result comparative advantage in a reasonably globally traded service. Thanks. That's an excellent comment, which I will incorporate in the paper. Then I will let you comment on whether its a sustainable comparative advantage or a fragile one that could disappear through an ill considered reflexive regulatory response, including ending capital gains taxation on carried interest. This article is very helpful! Awesome way to make my day better! Thank you! Comments are welcome. Keep it short, polite, and on topic. Thanks to a few abusers I am now moderating comments. I welcome thoughtful disagreement. I will block comments with insulting or abusive language. I'm also blocking totally inane comments. Try to make some sense. I am much more likely to allow critical comments if you have the honesty and courage to use your real name. This is a blog of news, views, and commentary, from a humorous free-market point of view. After one too many rants at the dinner table, my kids called me "the grumpy economist," and hence this blog and its title. In real life I'm a Senior Fellow of the Hoover Institution at Stanford. I was formerly a professor at the University of Chicago Booth School of Business. I'm also an adjunct scholar of the Cato Institute. I'm not really grumpy by the way! Milton Friedman Institute. (2009) A response to the faculty protest at U of C. Fun. Opeds, blog posts, media, etc. Art, animation, comics, and music. Steve Williamson A lot more than "new monetarism." Copyright John H. Cochrane. Simple theme. Powered by Blogger.